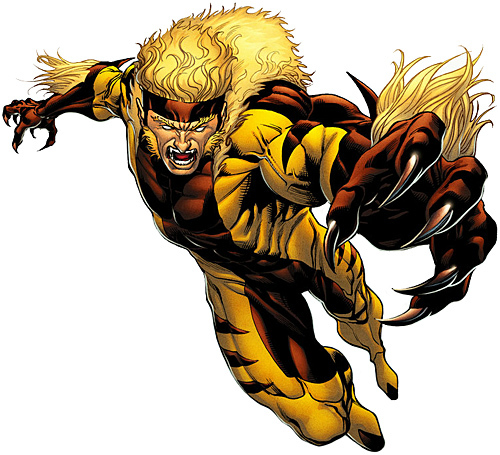 Enhanced Abilities: Sabretooth’s strength, reflexes and endurance are all at super human levels. Heightened Senses: Sabretooth’s sense of hearing, smell and taste are enhanced to amazing levels. He can track people using them and uncover illusions. Claws and Teeth: Sabretooth has claws and teeth that he can use to tear and rend flesh. Healing Factor: Sabretooth has a healing factor that means he recovers health incredibly fast after damage. Adamantium Skeleton: Sabretooth at one point had Adamantium bonded to his skeleton by Apocalypse. This made his bones unbreakable, however Apocalypse forcibly ripped it from his body when he failed to prove himself worthy to become Apocalypse’s horseman “Death”. Born Victor Creed to an abusive father, the mutant villain later known as Sabretooth grew up to be a special-operations CIA agent for the American government where he earned the nickname Sabretooth. During this time, he met and worked with a Canadian agent Logan (later, the hero Wolverine) and the two enjoyed a friendly rivalry. Later, however, Creed had a falling out with Logan during a mission in Berlin and the two became mortal enemies. It is presumed that Creed was somehow involved in the Canadian government's so-called Weapon X program, which experimented on human subjects to create super-powered humans such as Wolverine and Deadpool. Creed is said to be the ultimate warrior and survivor, and he loves to hunt, fight, and kill opponents. With the code-name Sabretooth, Creed eventually found his role as a hired killer.